Cam Lock finishing trowel allowing customised handle positions. Create the perfect trowel for every situation. Bevelled work edge to prevent aggregate popping. 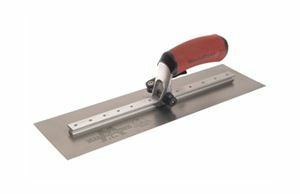 I-Beam mounting increases overall blade strength. Resilient Durasoft handle provides a soft feel, reduces fatigue and, excellent durability.